Create, Teach, Share is hosting a linky party on Post It Notes. I don't know about you, but I love sticky notes. One of my all time favorite ways to use Post It Notes is to encourage students to think about their reading. I often use blank ones to have students respond to a question or prompt that I give when I set the purpose for reading in my guided reading groups. However, I also love to use them to help students think about their strategy use during their reading. 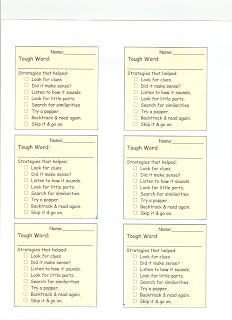 I will give students Post It Notes that I have printed and have them jot down notes about how their strategies helped them get past tricky spots. I especially like to do this when I am working on decoding with a group. After the students read, the Post It Notes help them remember what they did and how it helped, which allows them to participate in discussions about the strategies. I am sharing a document I made with some of the reading strategies I use. These strategies come from a book by Creative Teaching Press called Reading Strategies That Work. To use it you will need to print it out once on a plain sheet of paper. Next use the squares to line up your sticky notes and stick them over the squares. Make sure that the flat edge of the sticky notes (where the glue is) is the side that goes into your printer first! Also, you need to notice whether your printer prints on the top or bottom side of paper and make sure the sticky notes are on the side that will get printed on. Then print like normal. Peel off the sticky notes and reuse the paper. Love the post it note form. Is there anyway to send me a version that I can edit one strategy? What's a popper? A popper is when you sound out the first letter, read the rest of the sentence, and see if the word pops into your head. I just emailed you the template in Word. I love these! Thanks so much for joining my linky party! Thank you for sharing these ideas. Can't wait to use them! What a great idea! Is there anyway I can get a blank sticky note sheet to add my own info on? Jen, I would be happy to email you a blank one. Send me an email (go to the contact page up top) and I will. YOU are so sweet to share this! I too am a HUGE fan of sticky notes. Here's a link for coupons :D THANKS again!